Sometimes it feels like there’s nothing left to look forward to in a food landscape busy spawning franken-pastry hybrids left and right and “reinvented” pizza. But then along comes a product pairing nuts and canned meat and faith in the culinary innovation of the world is restored. Spam and macadamia nuts might appear to be an odd couple — Spam is all that is soft, smushy and meat-like, while macadamias are the crunchy nuts that go in my favorite ice cream flavor. 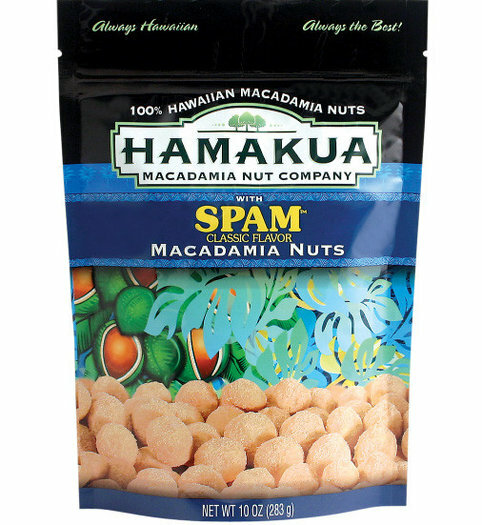 But these nuts do taste like spam, says Hamakua Macadamia Nut Co. out of Hawaii, reports the Los Angeles Times. There’s no pink dust or soft, inner centers, meaning there won’t be any actual bits of Spam when you open the bag. Instead, the President and Co-Owner Richard Schnitzler of Hamakua says the Spam flavor comes from a special Hormel seasoning blend. “Spam has a cult following in Hawaii and so it seemed like a good idea,” he explains. Anyone who’s ever had Spam and pineapple pizza knows this pairing is pretty darn natural, and sales have shown the item to be a popular one, says Schnitzler. So far the only way to get your hands on these nuts is to order them from the company’s website or online, but Hamakua says it’s in talks with a supermarket chain to bring them to California at some point. Or just go back to taking a bite of Spam and a bite of nuts, a bite of Spam and a bite of nuts, so on and so forth.